Dear Mr. Bouris – You’re fired! I am writing this because I feel you would greatly benefit from this recount of my online experience when I first engaged with the Yellow Brick Road (YBR) – don’t worry it’s not all bad. From a business perspective, The Celebrity Apprentice provides some unique and powerful advertising for the YBR franchise. However, it seems you may not have considered the people at the receiving end of your marketing campaign – your customers. Your company’s website is the first point of contact with your customers and instrumental in shaping their YBR journey. I apologise in advance if I seem overly harsh and critical. I work for a company (Objective Digital) who prides itself in making technology, particularly websites, more usable for customers and everyday users. Having worked with many financial institutions (including several of Australia’s top banks) we understand that amazing company’s can do amazing things, but are not so amazing at building websites – which is where we usually come in. I personally admire your enthusiasm and passion for educating people, and your strong belief in delivering affordable financial advice to the everyday person. For this reason, I would like to personally share my Yellow Brick Road experience. In the near future, I plan to invest in my first property and a home loan is something I will need. After watching an episode of The Celebrity Apprentice, I decided to investigate my options by looking on the YBR website. As a company that prides itself in giving Australians’ “access to quality financial advice”, my online experience was anything but that. To begin with, I had difficulty accessing information. The homepage was busy and confusing with no clear calls to action, making it difficult to locate useful content – this did not provide a good first impression. There were so many elements competing for attention I didn’t know where to look or where to find information that related to my personal situation and me. After typing ‘first home’ into the search box, I finally arrived at my destination. However, the financial advice I needed was not presented in a simple or logical manner leaving me more confused about home loans than when I started. My initial experience made me doubt the quality of the information you provide. In the high-tech world that we live in, a company’s website is usually the first point of contact for customers, and is seen as a reflection of that company. I am in no way saying your company lacks quality – after all, your company profile displays a collection of employees with a wealth of financial knowledge. Rather, my online experience resonated more with a company that is disorganised and mediocre rather than with a company that speaks quality and excellence. My attempt to locate my nearest branch was even more disappointing, forcing me to question the possibility of actually receiving advice. Instead of scrolling down the long list of branches to determine which was my nearest branch (at this point, a map would have been sufficient), I resorted to typing in my suburb – Kingsford. 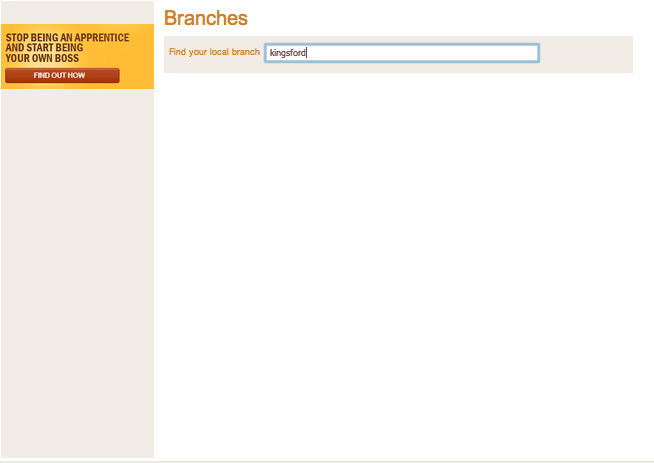 My search resulted in a blank screen, which implied there were no branches in my area. 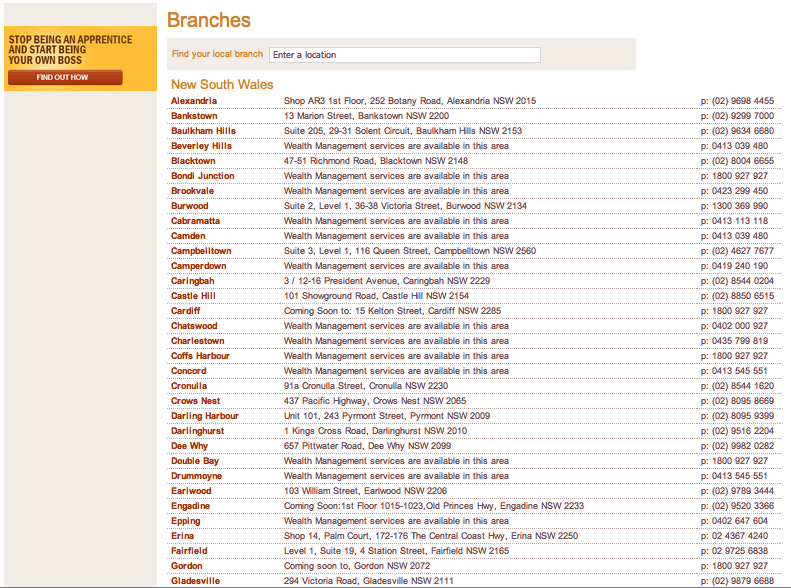 Although there is no Kingsford branch, it failed to tell me that Maroubra was, in fact, my nearest branch (I think!). As a Psychologist who works as a User Experience Consultant, I have an annoying habit of critiquing every website I visit. Despite my online experience, it has not tarnished my opinion of YRB. In fact, your performance on The Celebrity Apprentice was inspirational. The old me would have endured this painful online experience and complained about it afterwards to friends or colleagues. I don’t think this is the effect you envisioned with your Celebrity Apprentice marketing campaign. So, I placed myself at the boardroom table at YBR HQ, face-to-face with yourself, Dane Bouris, and Deborah Thomas (admittedly, I would be terrified if I ever found myself in this position). I would think… ‘Would Mr. Bouris be happy if I just left it at that?’ ‘What else could I do for the cause?’ Taking on the advice you have given others in the past, I underestimated my pulling power and need to step it up and bring my A-game. So here I am, voicing my opinion for you and others to read. You need to think about your customers, the people at the other end of your marketing campaign. Your website is the primary point of contact for your customers. As a potential customer I was sadly disappointed, confused, and none the wiser on home loans. I expected a lot more from you. For this reason, Mr. Bouris – You’re fired! This entry was posted in Usability testing by AlexisConomos. Bookmark the permalink. Alexis is a User Experience Consultant at Objective Digital. With a background in psychology, she has a passion for understanding WHY people behave the way they do.